The murder may be linked to the fact that the officials may have prevented the killer from implementing four projects estimated at nearly $60 million. 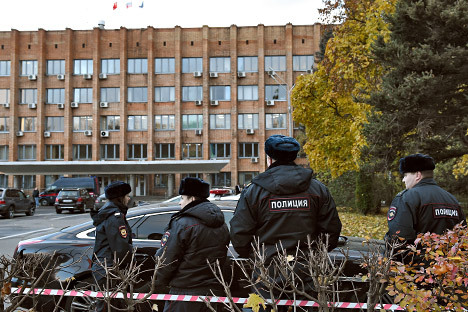 Businessman Amiran Georgadze, who was dubbed "the Krasnogorsk gunman" by the media, has been found dead at a private house in the village of Timoshkino in Moscow region\'s Krasnogorsk district, Russian Interior Ministry spokeswoman Yelena Alexeyeva told Interfax on Oct. 23. "Preliminary data suggest that Georgadze took his own life and that it happened on the day when he committed the crimes," she said. Police found his body in a private house in the village of Timoshkino at around 6:50 p.m., she said. "On coming home, the owner of the structure found a smashed window and, without entering the house, called the police who then found Georgadze's body," Alexeyeva said. For his part, Russian Investigative Committee spokesman Vladimir Markin said that "a man's body has been found in a forest not far from the village of Timoshkino." Efforts are under way to identify the body, he said. It was reported earlier that Georgadze came to the office of first deputy mayor Yury Karaulov on October 19, where he killed Karaulov and Krasnogorsk power grid chief Georgy Kotlyarenko. Later Georgadze killed Konstantin Smyslov, an elderly man who worked in the security service of the Moskovsky Komsomolets newspaper. Georgadze came across Smyslov while fleeing the police. Finally, while searching Georgadze's apartment investigators found the body of his fourth victim, identified as Trestan Zakaidze, the gunman's partner in the construction business. According to a source with law enforcement agencies, Georgadze had demanded $20 million from local administration officials in exchange for exiting his business, and after being refused, killed them and he recorded the killing on a mobile phone. Smyslov was killed as an unwanted witness. The gunman considered Zakaidze as a traitor who colluded with the Krasnogorsk district administration in order to Georgadze from the construction business. The Russian Interior Ministry announced a 1 million ruble reward for information that will lead to the detention of the Krasnogorsk gunman.